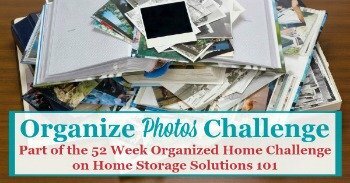 This week we're working on organizing our photos as part of the 52 Week Organized Home Challenge, but before you can devise a good system for organization that works for you, you need to make sure you're storing pictures and photos properly to preserve them for the future. That's because photos are actually rather delicate, and since they're often irreplaceable you need to take care to place them in storage or on display in ways to keep them looking their best. Photographs are developed or printed onto paper, and contain ink and pigments, and both the paper and pigments can degrade with time or in adverse conditions. For that reason the conditions the photos are stored in make a big difference in how well they will age over time. Ideally, when choosing the spot you'll keep your family's pictures, you'll think about these three conditions: (1) humidity; (2) temperature; and (3) light. The National Archives & Records Administration, which is where I got many of these recommendations about the ideal conditions for storing pictures, suggests keeping photos in an area with higher than 15% relative humidity and less than 65% relative humidity. In extremely dry environments photo paper can become quite brittle. But normally the issue is making sure you don't keep the photos in an area with too high humidity. If you've got your photos stored in your damp basement, for example, it encourages mold growth and can also cause the pictures to stick to each other as they get moist and the ink and pigments run and fade. Higher humidity also can cause more insect infestations of paper, which can destroy your photos. Temperature is also something to consider. The lower the temperature, typically, the better, because this slows down degredation of the paper and ink, and also discourages insects. Definitely store your photos in an area that consistently stays below 75° F at all times. That means, for example, your hot attic is not a good place for the photos. Large temperature fluctuations actually are not good either, so most garages are also out of the question for photo storage, since they vary from cold to hot as the weather changes. It is best to store pictures in a climate controlled environment, which will typically control for both temperature and for humidity simultaneously. Storing photos in a dark location actually helps preserve them, because it keeps the ink or pigments from fading. Light in general, but especially UV and fluorescent lights break down images with time. We've all seen sun-faded photos before, such as those that have been out in frames for years, so you know that fading is a real issue. If you've got a favorite photo you'd like to display (and who doesn't) just make sure it is a duplicate and keep the original or at least one copy in the safer darker environment so that you can simultaneously enjoy the memory the photo provides on display while preserving a copy for the future. Because of temperature and humidity issues we've already determined that the attic, garage and basement are not ideal locations for storing your photos. But you also need to think about other issues when it comes to photo preservation when you decide where to store them. The biggest things to consider include protecting your photos from insect or rodent damage and from excess water. Insects and rodents love paper, so keep pictures out of areas which contain these pests. 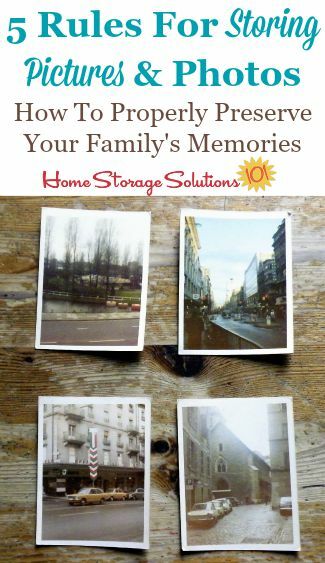 As mentioned previousy, damp and moldy photographs can also be a big problem, so keep photos from any areas that are prone to flooding or leaks, and also keep them up off the floor in case of a small flood to keep your family memories from getting damaged. When handling your photos, and also negatives, you should have clean dry non-lotioned hands. Still, even with these precautions always hold photos and negatives by the edge, and never put your fingers directly onto them. Your fingerprints contain oils and other chemicals that can permanently leave a mark on the photos or negatives. 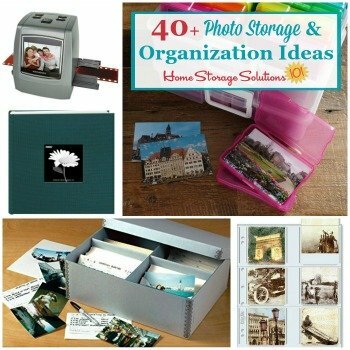 When organizing and storing your photos it is important to choose the right container for them, and the two main types are photo albums and photo boxes. Unfortunately, in the past people purchased all types of cute or cheap albums or boxes for their photos, added them, and left them for years at a time, and now years later they regret it. I cringe when I think about all the photos I added to magnetic and self-adhesive albums when I was a child, or all the photos I glued directly onto construction paper for scrapbooks. Ugghh. We now know that many of these things actually harm your pictures, such as non-archival quality papers which contain lignin and other acids, or adhesives which become yellow and brittle with age, and plastics that degrade and cause the photo to stick, sometimes permanently, to the album. The important thing to look for are items that are archival quality, and that are photo safe, acid, lignin and PVC free. You can find a large selection of archival albums on Amazon here and archival photo boxes here. When possible refrain from writing on photos, since often this leaves indentations on the photo, but in addition the ink can smear or get onto another image in the stack. If you're going to write on a photo (as opposed to writing information on a separate scrap of paper next to the photo) use an archival safe photo pen, and still don't press very hard. 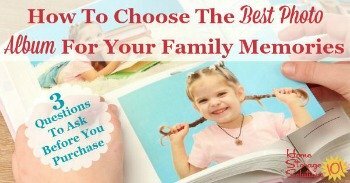 For a more in depth discussion of what type of photo albums to choose, check out my article on how to choose the best photo album for your family's memories. Finally, even the safest photo storage containers, that are archival quality, do not work properly if they are not filled properly. Do not overfill an album, since this can cause the pictures to get bent or creased, or to more easily fall out and get damaged. Further, photo boxes are a great way to store photos generally, but they need to be neither overfilled, nor underfilled. Overfilling a photo box can cause many of the same problems as an overfilled album. An underfilled photo box means that the pictures move all around, and can curl on the edges or get frayed or damaged. If you do not have a full box, use something photo safe in the box, such as archival quality dividers, to keep the photos from shifting around too much. Further, when filling photo boxes it is typically fine to stack the photos on top of each other loosely as long as you're not in a humid or high temperature fluctuating environment which might cause the photos to stick to one another. Some photo boxes allow you to "file" your photos on their side, with dividers. This can also work, but be sure then that the box is adequately filled so photos stand up straight without bowing and leaning, which can cause them to then not lay flat. 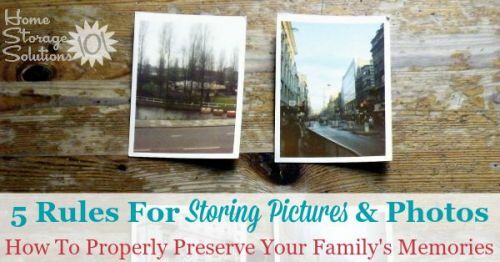 If you follow these five rules for properly storing pictures and photos your family memories will be much more likely to last over the course of many generations, just the way you've always wanted and envisioned. You can get even more tips for organizing photos here, in the Organize Photos Challenge.